Since mid-July, IHG Rewards Club has been offering a mystery bonus on purchased points. If you’ve been considering this deal, the clock is ticking, as the promotion ends on Wednesday, August 22, 2018, so you have just a few days remaining to take advantage of this deal. With this offer, different members are targeted for different bonuses, so you’ll want to log-in here to see what kind of a bonus you’re eligible for. 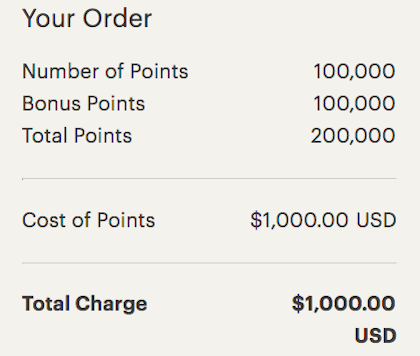 Personally I was targeted for a 100% bonus as long as I purchase at least 5,000 points in one transaction. If you’ve been considering buying IHG points but haven’t yet pulled the trigger, you have just a few days left to do so. Assuming you’re eligible for a 100% bonus, I’d say this could be a very good deal, especially in conjunction with the IHG® Rewards Club Premier Credit Card, which can get you a fourth night for free on award redemptions. While this isn’t for everyone, with a specific use in mind it could make sense to buy points.